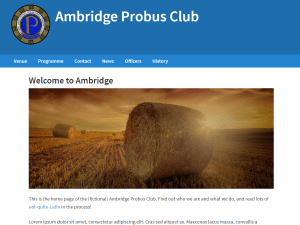 This service provides a website facility for Probus Clubs in the UK, enabling individual clubs to present an up-to-date view of themselves on the web which is both easy to maintain and affordable. The technicalities are taken care of, so you only have to provide the information to go on the site. To discover more of the benefits and to find out how your club could use this facility, visit our Website Service page. We have a directory of clubs using this website service. As the number of sites using this facility grows we hope to expand this to provide a fully searchable online directory of clubs, and an easy way for people to find Probus clubs in their area. That page also has links to other listings of UK Probus clubs. The quarterly printed magazine is produced by independent publisher Probus Media Services which also provides a range of other information to club members. This site has an online store offering a range of club badges, ties and other equipment.